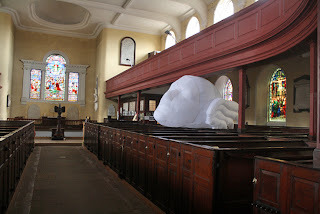 Macclesfield Barnaby Festival runs from 14-30 June 2013 with over 100 events and exhibitions (most of them FREE), including a two week Art Trail with three major site-specific installations funded by Arts Council England. Barnaby, a community festival run entirely by volunteers, is a re-invention of a centuries-old tradition of feast days and holidays celebrating St Barnabas. Every June, the town comes alive with music, performance, street theatre, visual arts, workshops and walks and talks celebrating the heritage and traditions of this wonderful mill town, made famous by its historic silk production. Local industrialist, Charles Roe, built Christ Church, a Grade II* listed Georgian gem in the centre of Macclesfield - dormant for 30 years - but brought back to life this Barnaby as an arts and performance venue. Christ Church plays host to art work by UK collective Brass Art (pictured), a live music concert by Peter Hook & The Light (sold out), a comedy evening with award-winning Radio 4 regular, Mark Steel (sold out) and a 'Summertime' performance by the Northern Chamber Orchestra, with a special guest appearance by pupils from Bollington Cross Primary School.